For months, pundits and experts have been predicting the demise of the Trump campaign. As we start the Republican primary season, Donald’s campaign is stronger than ever. While theories abound regarding the Trump success, it is clear that an angry, disassociated electorate is demanding wholesale change. Business executives would also be wise to observe how Mr. Trump has ridden this wave of discontent. Anatomy of Disengagement Last month I discussed how traumatized employees can disrupt and derail an organization with active disengagement. Business restructuring, extended periods of unemployment, underemployment, and the increasing number of jobs offering partial employment are all sources of stress for American workers. Add the inability of Federal government to act, mindless “tax and spend” State government policies, and the threat of violent crime and domestic terrorism, and we have an electorate ready to toss institutional conventions and embrace radical change promised by Mr. Trump, Cruz, and Sanders. Mr. Bush, national political parties, the news media, and other fading institutions are being ignored pushed aside. On Politico.com, Matthew MacWilliams presented research that concluded the most dominant trait of Trump supporters is an inclination toward authoritarianism. People with this trait are obedient to authority, drawn to strong leaders, and react aggressively to outsiders. MacWilliams estimates that 49% of Republican voters have this trait. Whether through profound wisdom or sheer luck, Donald Trump has done an outstanding job resonating with this voting bloc and it is becoming increasingly clear that this group has little interest in candidates tied to past government dysfunction and the institutions that have supported them. Will skipping this week’s debate over a disagreement with a Fox journalist harm his popularity? Not likely. Readers familiar with style assessments, like DISC or Meyers-Briggs, might see an analog in the business world. Business organizations have a group of decisive, results-oriented executives and a much larger group of detail-oriented workers that build and deliver the products of the organization. The latter group prefers consistency and is usually loyal to the organization. When this group accumulates enough traumas and stress that they disengage, bad stuff happens. In addition to deteriorating productivity, key employees can quit in mass, executives get fired, and boards get dismissed. Recovering Engagement Restoring an organization’s trust in leadership requires time and commitment on the part of the leaders. There are three general steps to recovery: emotional connection with the disengaged, validation of their worth and role in the organization, and a clear vision for how the organization will move forward. While Mr. Trump’s comments about Muslim immigration, the “Mexican wall,” and labeling some candidates as low-energy have mortified much of the country and global community, they have struck a chord with his target group and demonstrated an understanding of their frustration and insecurities. I believe Establishment candidates’ difficulty in getting traction with their campaigns is rooted in a perception that they caused workers’ distress and their inability to establish an emotional connection. Without that connection, their candidacies are going nowhere. In the book Critical Conversations – Tools for Talking When Stakes Are High, the authors write of the importance of an executive publicly owning their role in creating a conflict or crisis and hearing workers’ upset before any discussion on how to move beyond the problem proceeds. The goal of the conversation is for workers to feel their worth to the organization has been revalidated. Many executives stumble by failing to articulate a vision for how the organization will move forward. Mr. Trump has yet to address such a vision and could stumble, as well. The vision requires enough detail and thoughtfulness that an audience of detail-oriented people can understand the plan and their role in it. 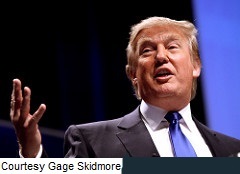 Watch Out for New Paradigms Many of the articles I have read recently about Mr. Trump’s success share the idea that Mr. Trump’s campaign is revolutionary and a harbinger of what is to come in American politics. David Von Drehle, in the January 7, 2016 edition of Time, presents the term “disinter-mediation.” Mr. Trump entered politics which an established brand highlighting an aggressive, successful businessman. He has bypassed the national party, big-money PACs, and the news media to take his message directly to the people over social media. Using Twitter, @realDonaldTrump gives access to people to ask questions and feel closer to the candidate without mediation from traditional power centers. There are changes afoot in the business world that will impact employee engagement. America has long celebrated the “hands-on” manager who remains involved with vocational activities while juggling managerial responsibilities. The increasingly critical scrutiny that all leaders are facing will drive managers to focus more on management. The ever-tightening labor market will give talented workers increased leverage to demand that managers focus more on leadership, communication, and employee development. Disappointment will result in turnover.